Level Up!! 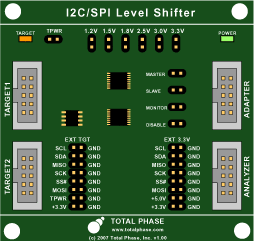 Save now on Level Shifter Boards. Offer valid for online credit card orders at www.totalphase.com. 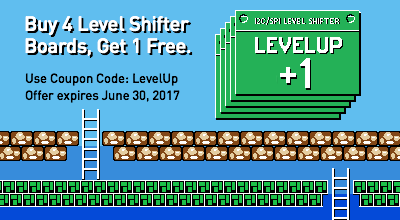 To receive this discount, enter the coupon code "LevelUp" during the online checkout process. Coupon codes must be entered at the time of purchase in order to qualify. Offer valid on Level Shifter Boards only. Promotional coupon expires June 30, 2017. Limit one coupon per order. This coupon cannot be combined with any other promotional coupon. Total Phase reserves the right to terminate this offer at any time. The products were shipped promptly. I found them to be exactly what I expected. They are working very well and have met my needs. I really feel they are a good tool.